When you hear about a quad-core phone with a large HD screen, you’d probably think about a very expensive top of the line device like say the Samsung Galaxy Note II or the LG Optimus G. But while those devices cost a ton of money, you can now get a quad-core phone for an off-contract price of merely $260, almost a third of the price of say the Note II. That quad-core phone is one of many more to come, and it is the Micromax Canvas HD, sold in India for the extremely affordable 13990 rupees ($260). 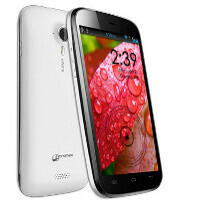 The Canvas HD packs a 5-inch 720p IPS display, an 8-megapixel camera and dual-SIM functionality, all of that running on Android 4.1.2 Jelly Bean. How is it even possible to put all of that into such an affordable phone? The key is the new chip by Mediatek, the MT6589, a quad-core solution that costs a fraction of what silicon like the Exynos chip cost. Truth is, quad-core does not tell the whole story, and it is the actual performance that matters. The MT6589 is based on the new low-energy Cortex A7, delivering a performance of 1.9DMIPS per MHz. Now, to put this number into perspective, we’d need to mention that the Krait processor in Snapdragon S4 MSM8960 delivers 3.3DMIPS per MHz. But since it still ships in a dual-core setup in most phones, the theoretical performance of the quad-core Canvas HD would be almost on par with a dual-core Snapdragon S4. Quite an achievement. It’s no wonder the Canvas HD sold out in hours after its launch in India. And while the Micromax device is only available there, a ton of other handsets with the MT6589 chip are coming soon from China and will definitely end up on eBay and other retailers. I'm not convinced of it having a long term life. The shopping motto "you get what you pay for" still applies here. you can but new virtue phone. It will cost you 7900 euro. you get what you pay for" still applies here. and it has a very long term. say hello to indians..... HELLO!! Hello back. JK, this is a good phone. I am not completely sure. I am saying from benchmarks of prototype phone. Galaxy grand screen is inferior. you can't even do simple math? Now finally there is a company in India which does not only stack up money but also provides Quality. Good work Micromax . Now no one will say that India is behind in the Smartphone Quality. atleast indians cannot be brainwashed by any fruits or samdog! Will someone explain "mips per mhz"? Cause "quad core canvas HD performance on par south a dual core snapdragon" is throwing me off! Sounds like the new quad core has the power of a dual core. And, why would anyone want that? On par with s4 krait?? I believe not . The benchmark scores aren't all that amazing on this phone. Antutu, quadrant and nenamark2 scores are below galaxy grand. You can check it inwww.igyaan.com But its affordable for someone who isn't bothered by benchmarks and can run even the most graphic intensive games in the store. Cause it says "quad core" on it. That's the trick Mediatek uses, more marketing than actual staff. DMIPS/MHz is how normally risc processors are measured, it means Dhrystone Millions of instructions per second. DMIPs is how powerful a chip is, DMIPs/MHz gives you how powerful an architecture is not taking into account the clock speed. But it won't get even near a Tegra3 or Exynos 4412, much less a quad core with Krait cores. Nexus 4 just got blown away by this bang for the money. India is an enormous market and Micromax is taking the opportunity .. they will grow huge there! darac, Nexus 4 is around TWICE as powerful than than phone, but in GPU and CPU... So nope, it didn't get blown away at all. There are loads of cheap phones with cheap SoCs, what the Nexus 4 offers is top performance on par with the other flagships for the price of a midranger. Problem with Nexus4 is no sdcard and non replaceable battery. absence of expansion slot i can live with it but non replaceable battery is a deal breaker for me. It's not available for $350 outside of where there are no Play store device seller supports. Really?! Comparing a Mediatek SoC with a Snapdragon SoC. Come On! So who will buy Apple Plastics for $300 pre import which means $450 landed which is roughly Rs 24000. Even Samsung Galaxy Grand tough time. The other day i mentioned that in India an ythin g that goes about 12-13 k is considered expensive for a phone and all want the largest screen. Micromax has greater share than Apple in market and now they hav e entered Television segment also.